Leading Edge Institute offers a business reshaping system to help you connect with key stakeholders and drive successful business engagements. The secret to your success is found in Leading Edge Institute’s integrated approach, our small group sizes, our customized curriculum, and our hands-on demonstrations that drive home the principles we discuss. Each component of our system has a logical progression, and no component works without the other. You can come to us at our location for training or we can come to your location. Call 919-906-7999 TODAY to discuss consulting services with Leading Edge Institute. Each component of our system has a logical progression, and no component works without the other. The four steps of our system are outlined below. You can come to us at our location for training or we can come to your location. Through a strategic conversation and survey results, we learn your organizations strengths, opportunities, interests and limitations. We help you assess how you connect with clients, partner vendors and your team to reveal any gaps in stakeholder engagement. In a series of strategic planning, team building and leadership development sessions, you will work through the strategic planning worksheets to ensure that mission, vision, values and actions are in perfect alignment. At the end of the sessions, we pull together the results of the activities into a strategic planning document for your organization. Throughout the year, we regularly meet with your team to discuss the implementation of goals and objectives, review metrics to understand gaps in the implementation process, and revise action items to ensure alignment with the plan. During this phase, we also modify the plan if needed. At the end of the year, we meet to discuss the implementation results of the strategic plan. 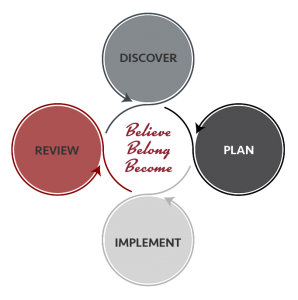 We review what items were completed, analyze results and begin the process again, all with a goal to keep your organization on plan with connected stakeholders and successful business engagements. As flame forges iron, one company can reshape another. Leading Edge Institute reshapes businesses.